the engineer's other life: Scary September - prints! Beajay, I have not forgotten the challenge! I promised to finally sew some clothing in a printed fabric. 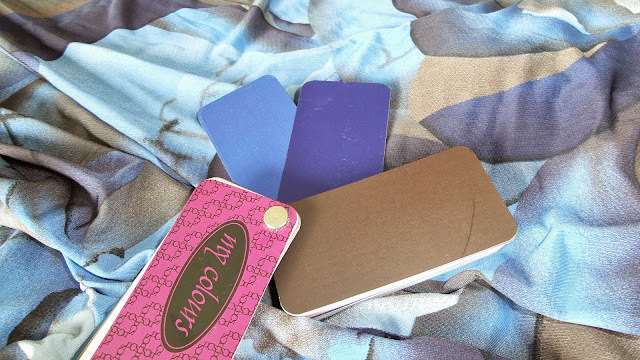 The colours even match those in my swatch. See, I checked my swatch. It's all good! During a month of unpacking, dealing with tradespeople, throwing parties (all the normal house-moving things), I have indeed managed to sew something. It's not exciting, it's not even a new-to-me pattern. I present Style Arc Mia, in a knit WITH A PRINT. There isn't much to add to my earlier review of the pattern. 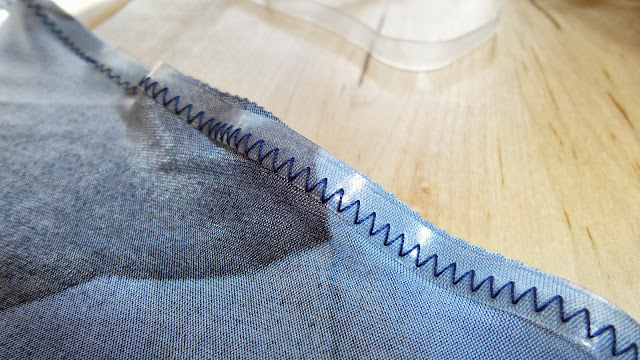 I used some clear elastic on the surplice front edges, to minimise stretching them out. I didn't use any facings, as they would have caused more problems than they would solve in this slinky knit. At this stage the front is held with a pin, but I'll add a snap or hook and eye when I get a chance. Clear elastic is useful if you sew knits regularly. I just attach it with a zig-zag. This dress is such a great "throw it on and go shopping" style. Now that the house is (kind of) sorted, I should be able to post more regularly! Wow - you have certainly nailed it. That is a great dress in a beautiful print. I will be doing an update on the 1st. Great job. I'm apparently a cool/deep, so there are a lot of rich blue-based jewel tones in my collection. I love seeing the difference when I pick the right fabric! 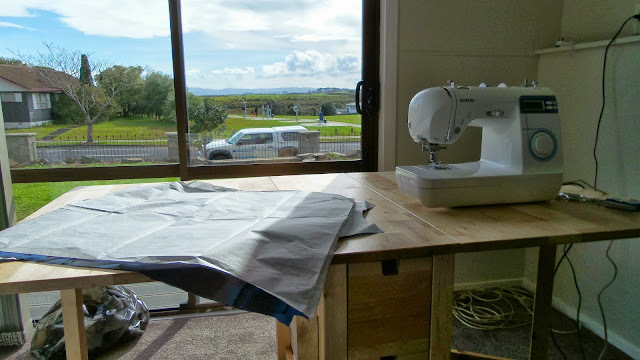 Pretty dress and I love the view from your sewing room - how nice to have so much natural light and sunshine! Lovely dress. This may lead to more prints you know..
Huzzah for your return to sewing! You have such a lovely view from your sewing machine, too. The view is very relaxing (and occasionally entertaining, when I see people doing bizarre exercises on the workout equipment across the road). LOVING the view from your sewing table. Dreamy!! And great to see you in a pattern! Your wheel didn't lie - those colours are fab on you. Very nice! I love reading about your French jacket adventure... sounds amazing! Love that dress on you Kat! I've just inherited my grandmother's wizz bang sewing machine and overlocker....may be asking some tips down the track!! I wish I had those skills! Looking good Kat. Love the dress.